↑ Akyabza Kalzang Drönma was the third consort of Dudjom Lingpa and the mother of Tulku Dorje Dradül, Tulku Lhatop and of Patrul Namkha Jikmé. ↑ Dampa (d.1891) was a direct disciple of Dudjom Lingpa who recounts in his outer biography that In 1891, on the twenty-first day of the first month, my disciple Dampa passed away This passing was foretold to Dudjom Lingpa by Dakini Sangwa Yeshe, Secret Wisdom, who told him in 1890 Your disciple Dampa will be born in the dakini country of Orgyen on the twenty-first night of the Rabbit Month (Dudjom Lingpa, ‘A Clear Mirror’, The Visionary Autobiography of a Tibetan Master’, The Outer Autobiography, translated by Chönyi Drolma, Rangjung Yeshe Publications, 2011, p174). ↑ Gegong Khenpo Kunzang Palden, a direct close student of Patrul Rinpoche, received the transmissions of the Dudjom Tersar directly from Dudjom Lingpa (Source Tulku Thondup, "Masters of Meditation and Miracles", Shambala, 1996, page 259). 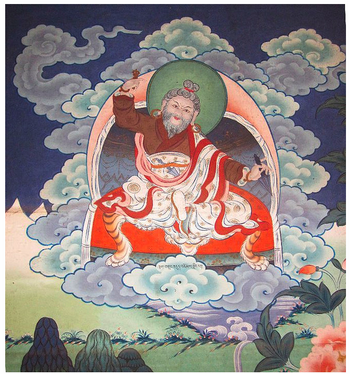 ↑ Karma Kunchok was a student of Dudjom Lingpa. In 1863, when Dudjom Lingpa was 28, he returned to his homeland with four retreat companions to do a retreat based on a Guru Dorje Drolö practice revealed by Rigdzin Düddul Dorje. Among his four retreat companions were Goser Onpo Khyenrab Gyasto Rinpoche, Karma Konchok, Lama Ten, Rikchok. (Dudjom Lingpa, ‘A Clear Mirror’, The Visionary Autobiography of a Tibetan Master’, The Outer Autobiography, translated by Chönyi Drolma, Rangjung Yeshe Publications, 2011, page 87). ↑ Khenpo Kunzang Palden received in Ser Valley the transmissions of the new ter teachings discovered by Dudjom Lingpa (Source Tulku Thondup, 'Masters of Meditation and Miracles', Shamble, 1996, page 258.). ↑ Kéza Sangye Tso was the second consort of Dudjom Lingpa and the mother of Khyentse Tulku Dzamling Wangyal, Namtrul Mipham Dorje and Tulku Trimé Özer. ↑ Kyechok Lingpa was a famous tertön and doctor from Golok, Serta, a student of Dudjom Lingpa, and the father of Tulshuk Lingpa. His granddaughter is Sangyum Kamala, wife of Chatral Rinpoche (source: presentation of empowerments granted by Sangyum Kamala in the USA in 2003. ↑ Lama Kyenrab was a student of Dudjom Lingpa. In his biography, Dudjom Lingpa recounts: “In the past, while staying at the Hor family’s homestead, Lama Kyenrab, Omniscience, from Nuzok [Monastery] requested me to transcribe a Jampal, Gentle Splendor, tantra. Accordingly, when I began that task on the tenth day of the middle winter month, thunder roared from the heavens and small hailstones fell erratically. I considered that to be indicative of a favorable coincidence, the thought of which made me quite delighted and happy, so I told the lama about it. He said, “During the winter, isn’t the sound of thunder something disastrous?” He made this and other pessimistic comments; I saw that there wasn’t going to be much of a good connection. I ceased writing after five pages and se it aside without transcribing anything more.” Dudjom Lingpa, ‘A Clear Mirror’, The Visionary Autobiography of a Tibetan Master’, The Outer Autobiography, translated by Chönyi Drolma, Rangjung Yeshe Publications, 2011, p.134). ↑ In his autobiography, Dudjom Lingpa recounts how he received a prophecy from Dakini Kuntu Gyuma who sang to him, ‘[In 1882], on the tenth day of the middle winter month, a woman appears saying she was Dakini Kuntu Gyuma Saljéma, Wandering All-Illuminator, and sang to me, ‘A superlative individual whose name ends with Rab, Highest, will accomplish the supreme illusory rainbow body if he isn’t fooled by circumstances involving the eight wordly concerns.’(Traktung Dudjom Lingpa, ‘A Clear Mirror’, The Visionary Autobiography of a Tibetan Master’, The Outer Autobiography, translated by Chönyi Drolma, Rangjung Yeshe Publications, 2011, page 158). ↑ Cited in the colophon of the Neluk Rangjung. ↑ According to Dudjom Lingpa himelf, [Lama] Puntsok Tashi — and Ngawang Gyatso— was “a custodian of his teachings”. Dudjom Lingpa, ‘A Clear Mirror’, The Visionary Autobiography of a Tibetan Master’, The Outer Biography, translated by Chönyi Drolma, Rangjung Yeshe Publications, 2011, page 72. ↑ Lama Ten was a student of Dudjom Lingpa. In 1863, when Dudjom Lingpa was 28, he returned to his homeland with four retreat companions to do a retreat based on a Guru Dorje Drolö practice revealed by Rigdzin Düddul Dorje. Among his four retreat companions were Goser Onpo Khyenrab Gyasto Rinpoche, Karma Konchok, Lama Ten, Rikchok. (Dudjom Lingpa, ‘A Clear Mirror’, The Visionary Autobiography of a Tibetan Master’, The Outer Autobiography, translated by Chönyi Drolma, Rangjung Yeshe Publications, 2011, page 87). ↑ Cited, in the colophon of text, as having requested the writing of the Sherik Dorje Nӧnpo Gyü. ↑ Rikchok was a student of Dudjom Lingpa. In 1863, when Dudjom Lingpa was 28, he returned to his homeland with four retreat companions to do a retreat based on a Guru Dorje Drolö practice revealed by Rigdzin Düddul Dorje. Among his four retreat companions were Goser Onpo Khyenrab Gyasto Rinpoche, Karma Konchok, Lama Ten, Rikchok. (Dudjom Lingpa, ‘A Clear Mirror’, The Visionary Autobiography of a Tibetan Master’, The Outer Autobiography, translated by Chönyi Drolma, Rangjung Yeshe Publications, 2011, page 87). ↑ Traza Sönam Tso was the first consort of Dudjom Lingpa and the mother of Dodrupchen Jikme Tenpe Nyima and of Tulku Pema Dorje. ↑ Tsé-chu was a major student of Dudjom Lingpa and unlike many other students who met Dudjom Lingpa after he gained renown, Tsé-chu was with him at least since Dudjom Lingpa was 37 years old. In his biography, Dudjom Lingpa recounts: '[In 1872], compelled by joy, my student Tsé-chu, Tenth Day, asked me for something to practice. When I transcribed a text for him, a rainbow stretched out like five silk ribbons sone above my house, a portent of his impeding liberation in the illusory rainbow body. At the end of his life in Lhasa, when he passed away, exceptional canopies of rainbow light and other signs and indications appeared. Everyone in Central and Western Tibet was amazed. During the middle winter month [of 1872] I practiced Dakini Tröma Nakmo during a month-long retreat. On that occasion I was accompanied by my supreme disciples Tsé-chu, Pema Tashi, and Orgyen. There was no one else apart from this trio. I cam to the firm conclusion that they upheld their tantric commitments. At that time, a rain of small feathers from vultures, the king of birds, fell; the house was infused with a sweet aromas; and others fantastic signs and omens appeared.' (Dudjom Lingpa, ‘A Clear Mirror’, The Visionary Autobiography of a Tibetan Master’, The Outer Autobiography, translated by Chönyi Drolma, Rangjung Yeshe Publications, 2011, p.133). This page was last edited on 6 March 2019, at 18:25.